Agile. Fluid. Always-on. Cross-platform. Transmedia. Mulitmedia. Social Media. There has been a revolution in journalism and communication over the past decade, and the only certainty in this fast-paced world is that things will continue to change. That’s why our primary focus is to challenge our students to think on their feet. To hone their craft. To practice, write and rewrite, design and deliver messages that speak to their intended audiences and reach them via the most suitable platform. JMC students learn how to relate to other people, how to ask questions and tell stories. They also learn how to understand and apply ethical principles in design, photography, videography and digital editing. Expect to contribute to democracy via the art of persuasion and representation, and to practice your skills in real-life settings. At AUBG we have a wide variety of student media, including the Griffins News newspaper and AUBG DAILY online news publication. We also have a student-run radio station, and opportunities to create TV programs as well as direct, produce, shoot and edit documentaries. The Journalism and Mass Communication faculty is committed to an academic and professional program that encompasses the knowledge and skills necessary to succeed in 21st century media. The program will emphasize critical thinking, research, writing, and visual communication skills within an ethical framework across all media and professional disciplines. The core required courses are the foundation of the program. They provide the theoretical, historical, ethical and cultural background that underlies journalism and mass communication today. The elective courses, presented in two tracks, focus on the skills needed to function in global media. The internship, either professional or academic, further enhances the acquired concepts and skills, as does participation in extracurricular activities on campus (i.e., magazine, online news websites, 24/7 radio station). JMC students are encouraged to enroll in other courses to expand their cultural and disciplinary perspectives , and also to major or minor in a separate discipline. This opportunity to shape a multi-disciplinary course of study within the liberal arts tradition is an invitation for students to enrich their knowledge base in preparation for further inquiry, research and understanding. Upon graduation, students are prepared to pursue a range of careers in a variety of fields ranging from media organizations, advertising and public relations agencies, design studios, production houses, and others or continue their education with graduate studies at leading universities around the world. 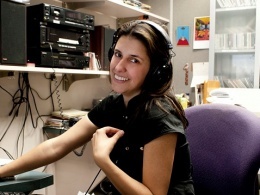 ~Monika Evstatieva '95, JMC, Producer at National Public Radio Washington D.C.